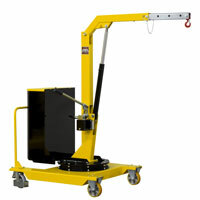 01M5 Manual Lifting Crane is an extremely versatile, easy to operate crane. 01M5 Manual Lifting Crane comes with a revolving jib extendible in 4 positions. Lowering is activated by turning a built-in knob which is mounted directly on the cylinder. The pump is equipped with a pressure relief valve that prevents operating above maximum capacity. Extension jib is also available on demand to increase outreach up to 1360 mm.